High resolution controls allow precise setting of voltage and current levels which are indicated on accurate and highly legible digital meters. Excellent line and load regulation is matched by very low noise and good transient response. Improved power efficiency ensures that the units require no fan cooling. Remote sense terminals are provided so that good regulation can be maintained across remote loads at high current. The EL302RD has two independent isolated outputs each with a 0 to 30V, 0 to 2A capability. The outputs operate in constant voltage or constant current mode with automatic crossover and mode indication. Each output has its own on-off switch. The outputs can be wired in either series or parallel to provide voltages up to 60 volts or currents up to 4 amps. 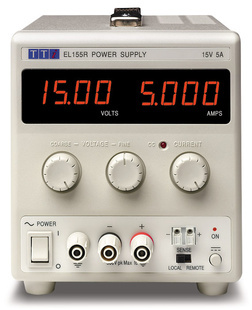 The EL302RT has, in addition, an Auxiliary ‘logic voltage’ output with a 2A current capability. This output can be preset between 1.5 volts and 5 volts via a front panel control. 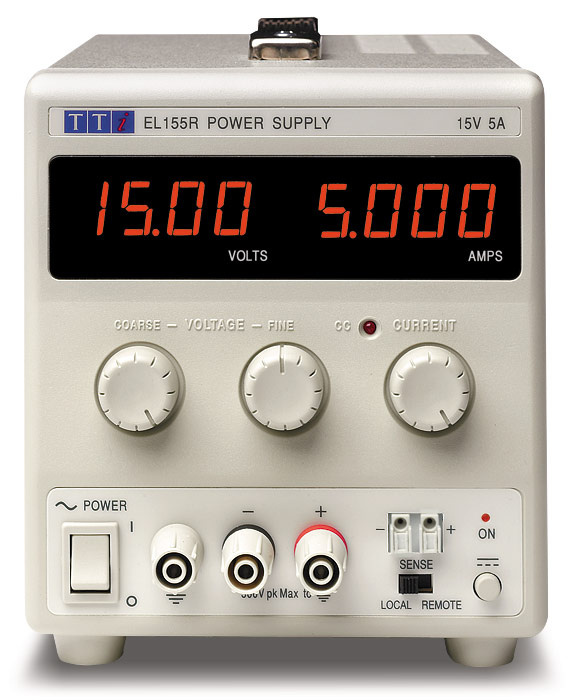 The EL155R, EL183R, EL301R, EL302R, EL303R and EL561R are single output supplies capable of supplying up to 15V/5A, 18V/3.3A, 30V/1A, 30V/2A, 30V/3A or 56V/1.1A respectively. The EL-R series incorporates separate digital voltage and current meters on each output. The meters use bright 14mm (0.56”) LED displays and have an update rate of 4 per second providing near instantaneous response. Simultaneous metering of voltage and current provides accurate information “at a glance” and avoids any possibility of misinterpretation. When an output switch is set to “off”, the current limit setting is displayed enabling conditions to be set before the load is connected. With the right-hand main output off the right-hand meters can be used to momentarily display the preset Auxiliary voltage and current limit. The EL-R series has been designed to meet the stringent requirements of relevant IEC standards for safety and EMC. All outputs are intrinsically short circuit proof, and are protected against external voltages and reverse currents.